Discussion in 'News and Announcements' started by john-hifi, Apr 10, 2014. The Hifiheadphones team is pleased to announce the new Digital Audio Player & DAC from FiiO, the X5 is now available to be purchased on our website. This is not your ordinary music player. 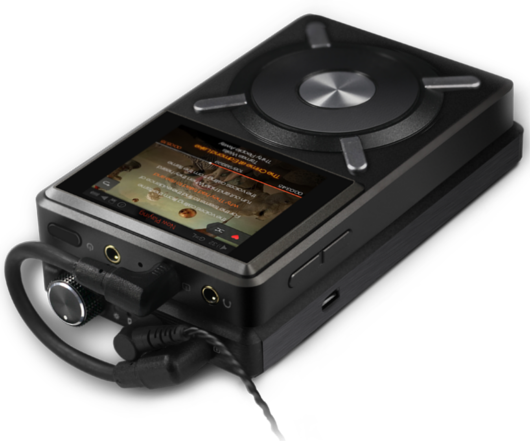 With impressive processing power the portable FiiO X5 digital audio player supports DSD, APE, FLAC, ALAC, WMA and WAV lossless music formats up to 192kHz/24-bit. This is the most complete set of supported formats to date among Hi-Fi DAPs. With the X5, music lovers need not worry about lack of format support or format conversion. As well as being a high resolution portable music player, FiiO X5 also doubles up as a dedicated digital-to-analogue converter with line or digital output from PC or MAC. The asynchronous USB DAC also supports 192kHz/24bit. Users can adjust the X5's equalizer according to their preferences, tailoring the X5's sound output to different headphones and music genres to produce their ideal sound. Inside the casing the X5 is packing a lot of punch with four Texas Instruments opamps and Burr Brown DAC as well as dual TI Flagship DAC Chip for headphone output. The X5 comes with three output ports: headphone out, line out and coaxial digital output. Apart from connecting directly to headphones, you can also connect it to other DACs and amps. Dual TF card slots offer a storage capacity up to 128GB, with future firmware upgrades supporting up to 1024GB. FiiO E18 Portable USB DAC and Headphone Amplifier - Coming Soon!